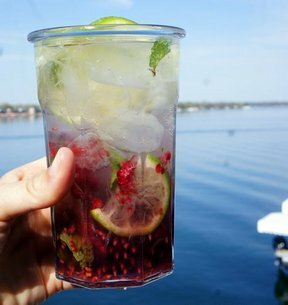 A chilled cocktail served in warm climates that combines 2 tablespoons of sugar, 2 or 3 sprigs of fresh mint, 1 to 2 ounces of white (light) rum, 3 tablespoons of fresh lime juice, and top of the glass with a small amount (or to taste) of chilled club soda. Native to Cuba, this beverage is made by crushing (with a fork, a muddler, a pestle, or a similar utensil) the mint leaves against the side of the cocktail glass. Lightly mix the sugar in with the mint and add a splash club soda until the aroma of the mint is noticable and the sugar is dissolved. 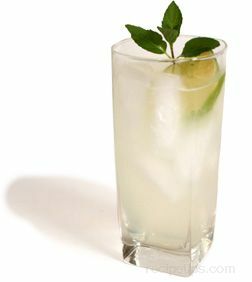 Add the fresh lime juice, the rum, garnish with ice, and top off with club soda, lime wedges, and mint sprigs. The sugar helps to release the essence and flavor of the mint to create a very refreshing taste. 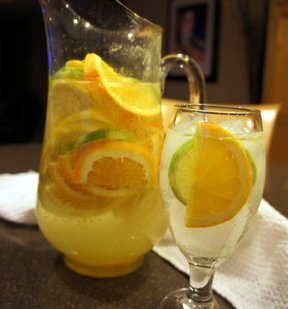 Some recipes for this drink include fruit, which is crushed in a similar manner as the mint sprigs. However, the crushing is easier with the use of a muddler, which is a round club-like utensil made of wood, stone, plastic, or stainless steel, that is used to easily crush the fruit and leaves in the bottom of a glass.